I purchased this little beauty back in the summer and it's fast become one of my most used cleansers and one I will definitely be repurchasing. I'll be posting a full review of this but it's basically a clay based cleanser that's great for skin that's on the verge of a breakout or has already broken out, it's not stripping and is a little bit like using a mask as a cleanser, it really works to calm down any spots and massively reduces them. Skin feels super clean after using and not stripped at all really, which I was quite surprised at. At £18, it seems quite pricey but you get a lot of product for your buck, I've been using this quite regularly for the past 4-5 months and still have around half left. One thing I will say is that I don't use a full pump of this, I think it's too much and there's a lot of wastage, I use around half a pump and I think that's ample. I've blogged about this before, click the link to take you through the the review, it's a really lovely cleansing balm, using all natural ingredients, it smells amazing and melts away all make up to leave gorgeous, soft skin. If you suffer from dry skin in the winter, check this out, it's really cleansing but really moisturising at the same time. It's a yellow balm with little beads of oil that break down as you massage the balm into your skin to add a very gentle exfoliating element as well. This is the cleanser I reach for most in the depths of the cold winter because I know it's not going to take anything from my skin. This is a really lovely oil cleanser, melts make up almost instantly and turns to a milky froth when you add water to wash it off, lovely and moisturising and leaves skin feeling super clean. I'm not quite sure how this does this either, but this literally melts my mascara, eyeliner and shadow away in seconds so I don't have to rub and tug at my eyes to try and get it off and as an added bonus, it smells lovely too, slightly floral, slightly like vanilla, slightly like the heads of Cabbage Patch Kids (anyone remember those?!). Really, really lovely product and I love the packaging for this too! Review for this cleanser is coming this week, it's the newest addition to the lineup but I've used it solidly for the past few weeks and it's brilliant, it's a cream cleanser that removes all traces of makeup and leaves that squeaky clean feeling to skin but with the bonus of feeling soft, supple and moisturised too, it's gentle on skin and smells good, looks good, It's an all round lovely product that I think will work well in the summer as well. My skin has been quite sensitive for the past few weeks and this has really helped with keeping it calm and not aggravating it any further. I'd definitely recommend this cleanser. So it would appear from the above products that I haven't been trying to save on my cleansers recently and they all fit into the higher end of the product price spectrum, but this gel wash is another of my favourites, it is a frothy wash which I know the skincare goddess herself, Caroline Hirons, isn't a fan of but there are those times when I just want a good old super clean feeling to my face and this really does that job, my skin feels clean, all makeup is gone and it isn't too stripping, it's not moisturising in any way but it is clean and as long as I follow up with a moisturiser shortly after, we're good to go. A great purchase and a great price. 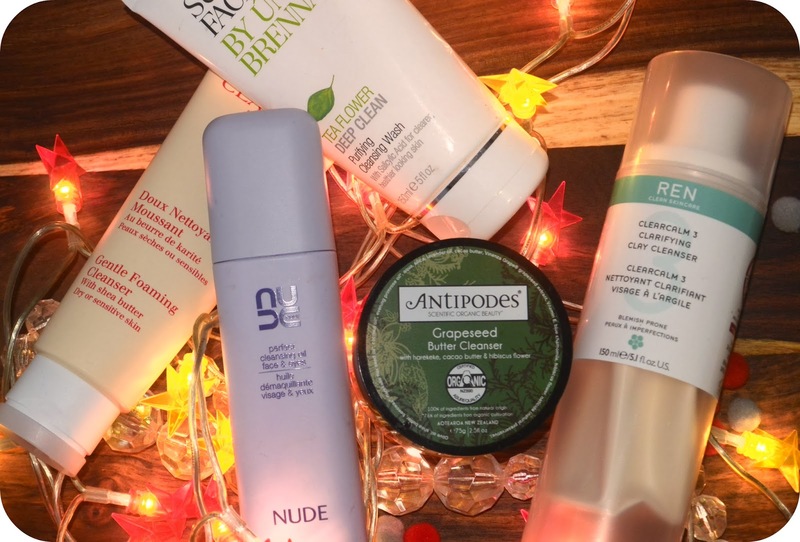 3 comments on "TOP 5 // Cleansers"
I love the Una Brennan range as well they all look like they should be far more expensive I think! I also like the NSPA gel melting cleanser so similiar to Clarins! Haven’t tried any of these, currently using Lancome comforting cleansing milk and it’s so good for my dry skin!